If I had known how much easier my life would be with faster Internet service, I would have upgraded long ago. It was no fun last week dealing with all of that but it is so much easier to upload the videos and photographs! Another slow-ish week...I did get a few lessons to review. I have been very pleased with the lessons from the students who are taking the Gauge class. It is wonderful to review lessons where it is clear the students have a good grasp of the material. I am anxiously awaiting someone to send in the first lesson of the Finishing Class. The first lesson requires a lot of knitting. That is the problem with seaming...you need two pieces. The third lesson is about buttonholes. I really enjoyed working on it. I researched a couple of buttonholes I haven't used in a project but I intend to now. 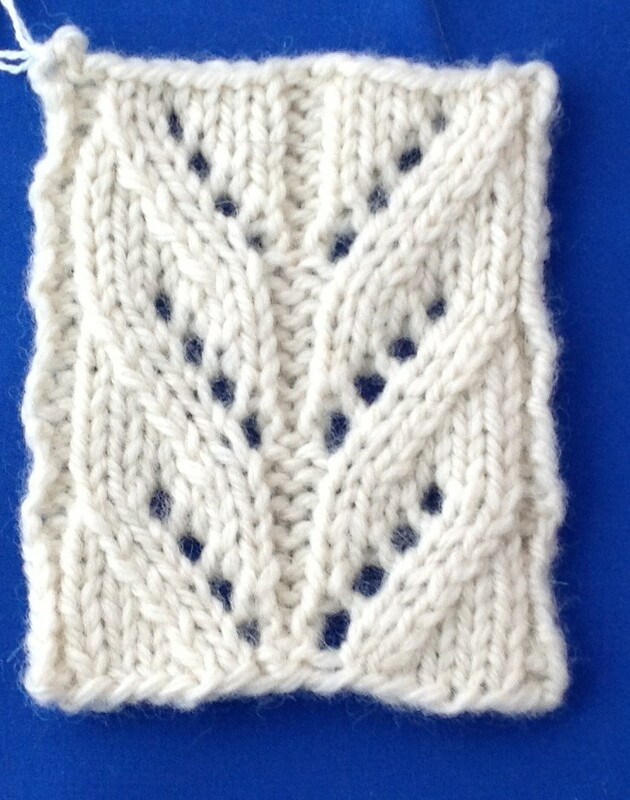 After the brief foray into stranded knitting, I am coming back to how to read your work. 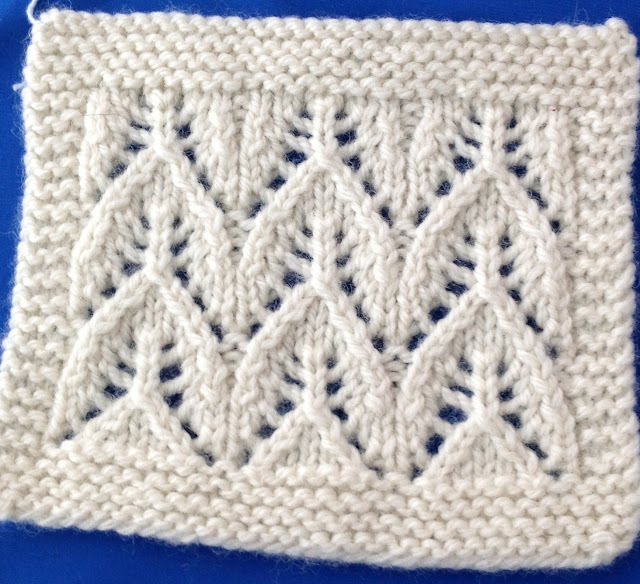 I had planned to do how to read simple lace patterns but decided it would be good to break it into two parts. 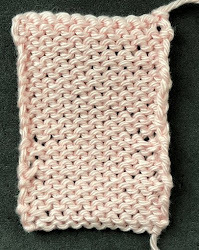 Most lace patterns consist of decreases and yarnovers. The placement and type of decrease is what gives the lace its look. You can really change the appearance of lace by changing the type of decrease. 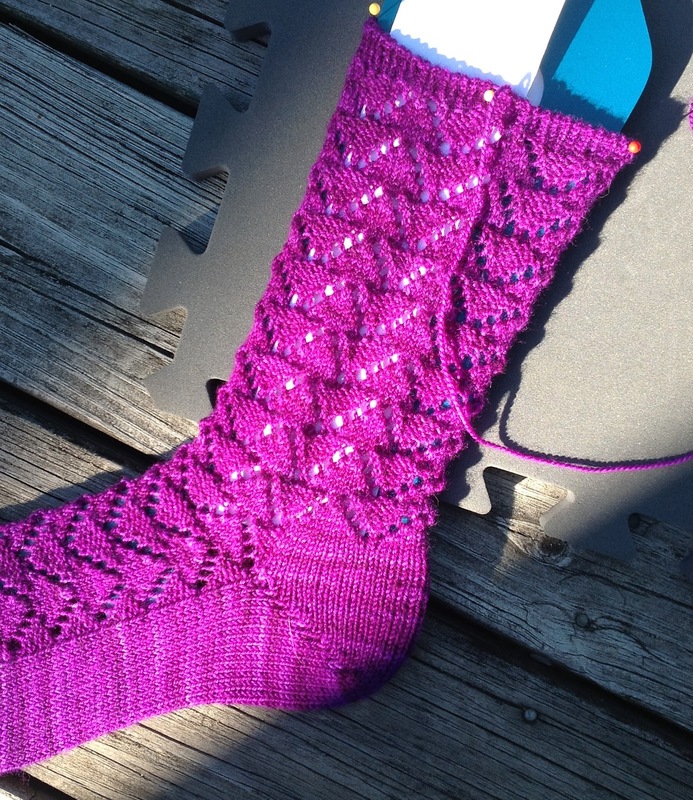 Several months ago, I knit a pair of socks where I fooled around with how to place the decreases. Look closely at the photograph below and see the difference the placement of the SSK and K2tog decreases make to the appearance of the triangles. When you place SSK decreases on the right side and K2tog decreases on the left, a "line" of stitches outlines the triangle. You see this frequently in lace patterns where the decreases outline the shape. In the triangles at the top, the placement of the decreases has been reversed which changes the appearance of the triangles. The K2tog decreases are on the right and the SSK decreases are on the left. There is no line of stitches. The decreases abut the edge of the motif. Now look at the top of the triangles where double decreases are used. In the S1K2togP decreases, the center stitch is on the bottom, and the stitch to the right is on top of the stitch to the left. 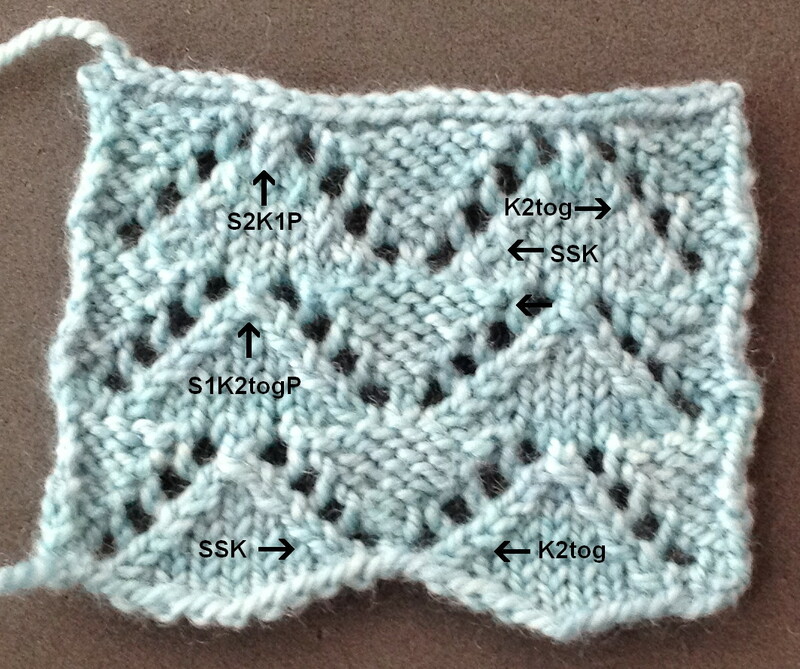 This decrease works well when you have used SSK and K2tog decreases to outline the motif. 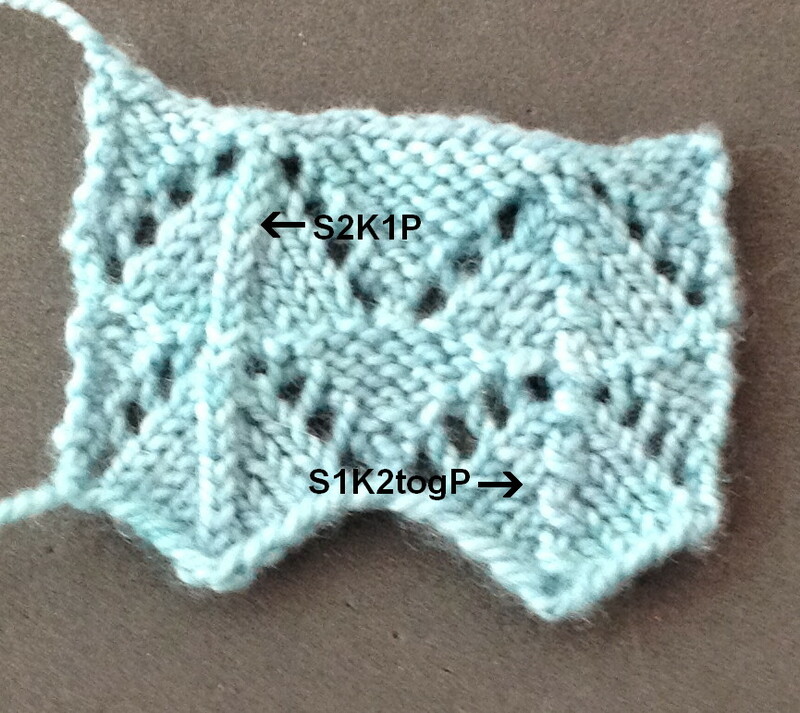 In the S2K1P decreases the center stitch is on top. Your design determines which decrease to use. Here is the link to the video: Reading Decreases in Lace. There is a quiz at the end of this post. In this photograph, the triangles are shaped by double decreases made in the center rather than with decreases at each side. You can clearly see the difference in the results of the two decreases. I thought I'd put in a photo of the socks to show my final decisions. By the way, these socks were for my friend Martha who really likes purple. 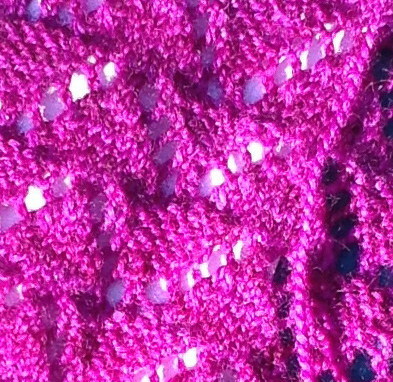 The yarn is Miss Babs and the color is Impatiens. It is the brightest purple I've ever seen. Speaking of Miss Babs, she will be at the Kentucky Fiber Festival in May. I am looking forward to it. I'll only be able to go on Saturday as I will be driving up to Mackinac later in the day. Salon will be on Saturday from 1:30 - 3:20. I've finished up one sleeve and have started the second. 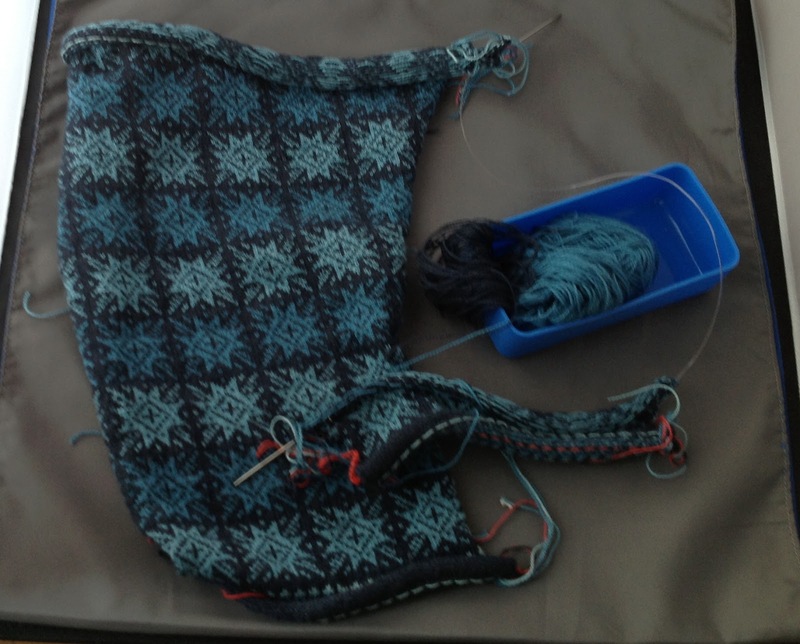 It is my plan to get this sweater done this week. I have really enjoyed working on it. I'm pleased with the results. I've ordered pewter claps which should arrive this week. Then on to the other projects for this issue. I haven't blocked the sleeve yet. Identify the type of decreases used in these two lace swatches.